Connie's World Adventure! : Unawatuna, Sri Lanka: Sri Lanka Has Beaches?? 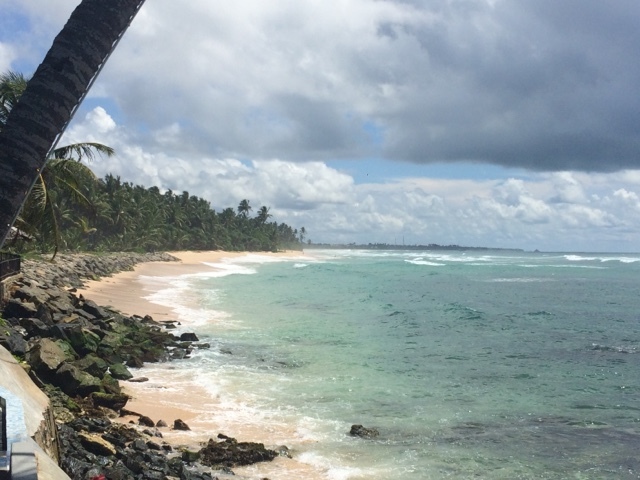 Sri Lanka is an island; of course it has beaches! 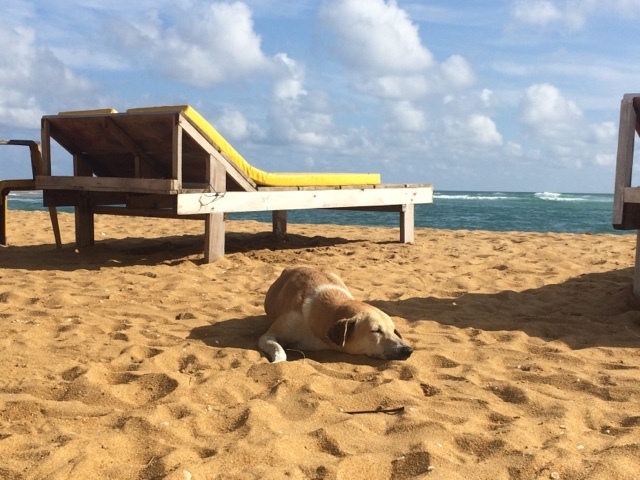 But I had no idea the extent - I had only seen some beachside towns recommended on online message boards. 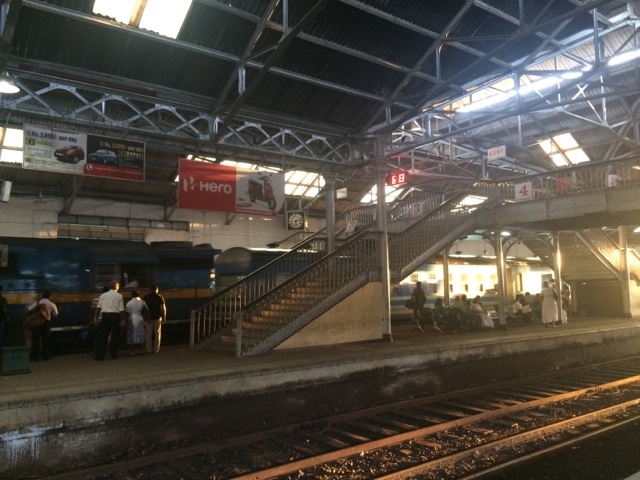 So with that and only a vague idea of where I was going, I headed out to the coastal town of Unawatuna from Colombo the next morning by train. On that note, does anyone remember there used to be a show featuring Bridget, one of Hef's girlfriends from the reality series "The Girls Next Door," called "Bridget's Beaches"? Of course you do. It was on some travel network and Bridget would travel around the world going to all the beaches and give her take on them. It seemed like a dream job. And I now feel like I have that job, minus the actual show and salary and fame and glory. I used to be happy in the past by just being at the beach, but given the amount of beaches I've been to over the past couple weeks, I now have an inner beach critic in my head that thinks things like "The sand particles here are too big" or "These waves crash too close to shore." 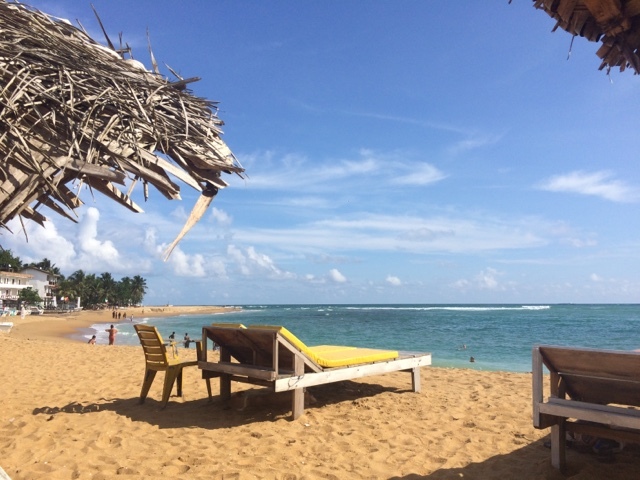 Even with that, Sri Lankan beaches are some of the most beautiful places I've ever seen in my entire life. They look like those nondescript calendars you used to buy titled "Beaches" or "Puppies" and would feature a whole bunch of gorgeous stock photos. Every beach here looks like it belongs in that calendar. 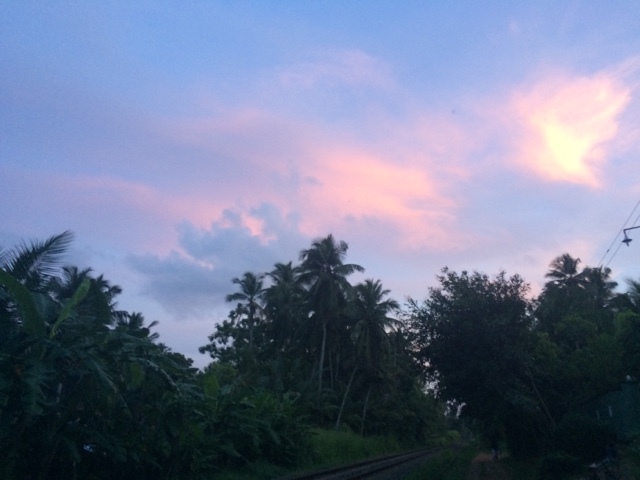 Took a train from Colombo down to the city of Galle - Unawatuna is only about 5km south of Galle. The trains were so, so cool - they look exactly like what you always see in movies, with the old rambling cars and open windows and colorful exteriors. 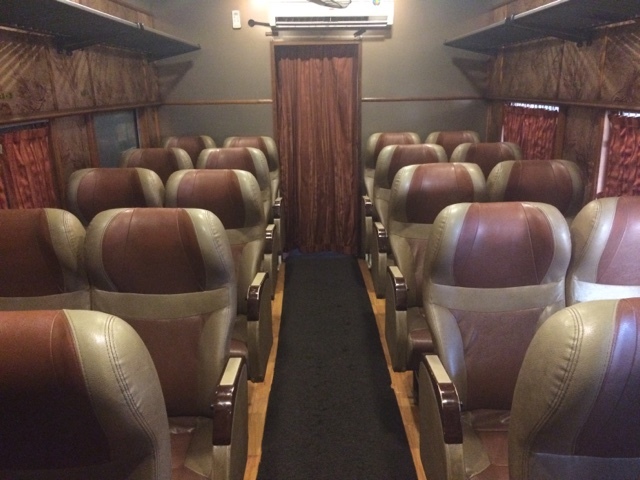 I ended up booking a seat in super-first class given that's the only one that can be booked online. Which means I got a reserved seat in the only air-conditioned car there is. And that I was the only one in it, given the price differential between 1st, 2nd, and 3rd class (2nd class is about $1, while 1st class is a whopping $7). Arrived in Unawatuna (the whole time the tuk-tuk driver was driving me from Galle station to the hostel, he was scolding me for booking a hotel so far from the beach). Checked into my hostel, which (the tuk-tuk driver was correct) was nowhere near the beach. The hostel owner had a couple of his friends hanging out at the hostel, and one of them offered to give one of the girls staying at the hostel, EK, a ride to the beach. Which I promptly jumped on board, given I didn't want to be stuck walking 45-minutes to the beach either. He told his he first had to pick up a friend from his hotel: which turned out to be this gorgeous villa hotel right on the water (aka probably the exact opposite of where we were staying). His friend ended up taking awhile (read: forever) to check out, so we sat on the hotel's fancy back patio and had the most delicious orange juice I've ever had in my life. One of those moments that's incredibly random when you think about it: me, EK (who is from Australia and also traveling solo for an extended period), and 3 random Sri Lankan men I had just met 5 minutes prior, having juice on the patio of some random gorgeous villa hotel. View from the fancy villa hotel. One of most breathtaking sights ever. An hour later, the guy had checked out, and we were finally on our way. 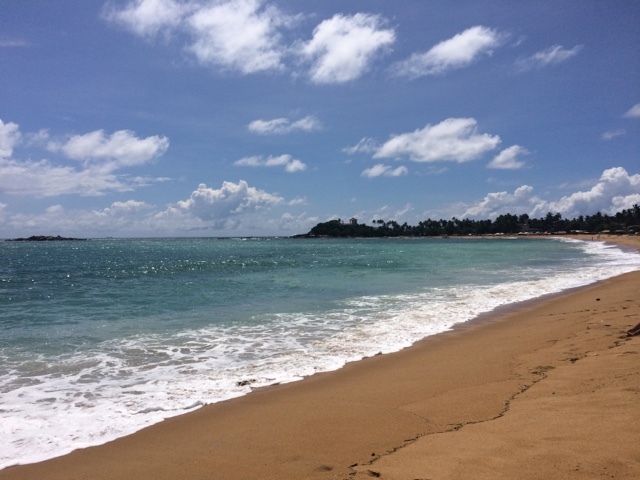 EK and I were dropped off at Unawatuna Beach, and we headed down the beach at last. It was one of the most relaxing days ever - EK and I found beach loungers and spent the day chatting about our travels, enjoying coconuts by the water, and sunbathing (and by "sunbathing," I mean I hid in the shade because I am pretty sure my skin is suffering from sun overload at this point. I've had a handful of locals guess my ethnicity as Thai, which you know signals a real emergency). We later went wandering through some of the town, which is adorable and has tons of little shops, restaurants, spas, and guesthouses. 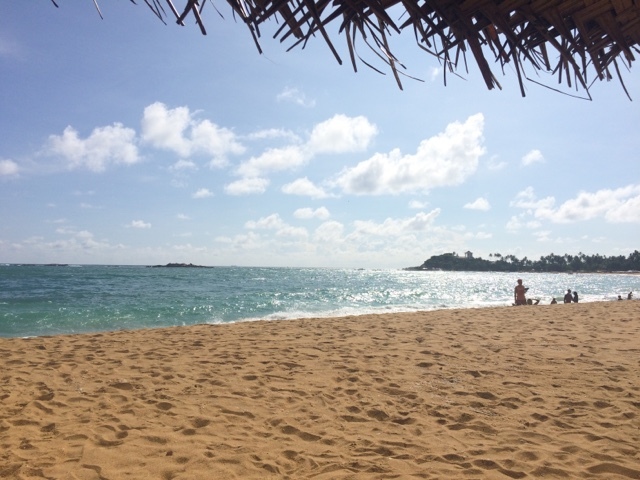 Unawatuna Beach. And the beach was so empty and perfect! 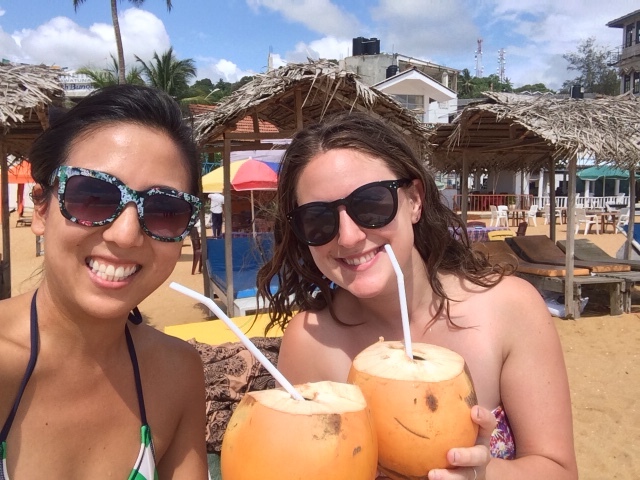 Coconuts! These are a kind of coconut called tender coconuts, and they are orange and oblong-shaped with pointy bottoms - and the coconut water inside is much less sour and much smoother-tasting. Delish. Later that evening, our hostel owner (nicknamed "Bunchy") had a bunch of his friends over and made plans to watch the World Series of Rugby (which is a thing people apparently care about) at a bar on the beach and was happening that evening. If anyone cares, New Zealand was playing Australia for the final. Maybe it was called the World Cup of Rugby. That makes more sense I think. Before the match (which started at 9pm local), EK and I headed to town to grab dinner first. We ate at a place that had tables right out on the beach - it was super dark and so, so nice hearing the crashing waves while eating. 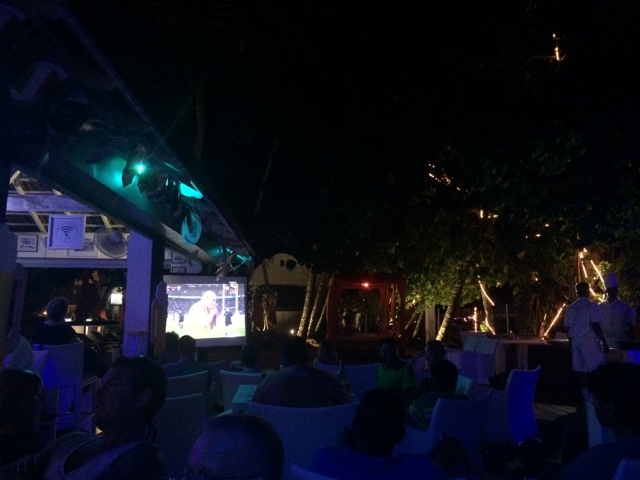 Watching the World Rugby Match Final (yet another name) on the beach on big screens. I've never watched rugby before. It was interesting. After the game, the guys (Bunchy and his friends - who I learned come down to Unawatuna and hang out at the hostel all the time to party with Bunchy) - took us to a beach party at a bar that was "best on Saturday nights." It was straight up just a club on the beach. There were a couple torrential downpours while we were there, which we were told meant it was a more toned-down party than usual. Which basically means the entire bar was packed with 100 local guys, and like 5 white tourist girls. It was the most dude-heavy place I've ever seen in my life. EK and I headed home a little early (which is 2am and incredibly legit for me). All in all, an incredibly random, interesting, this-is-what-happens-when-you-travel kind of night. Sri Lankan women are very conservative - which means you rarely, if ever, see them out and about. This means bars and clubs and restaurants are often filled with only Sri Lankan men - as the women are often at home. 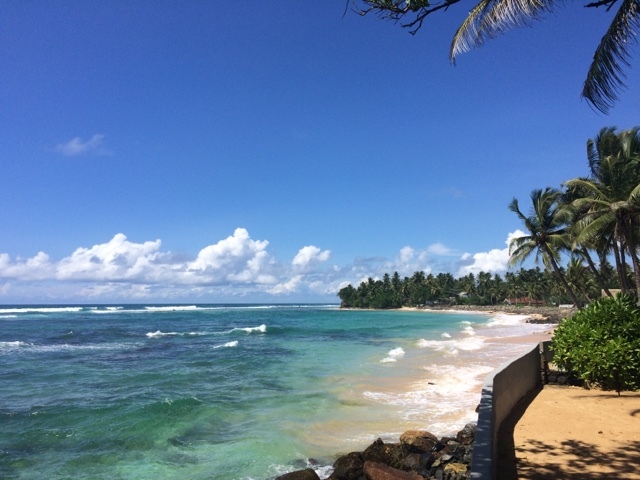 There are so, so many beach towns in Sri Lanka along the South Coast - each has their own vibe and feel and size and thing they're known for - i.e. whale-watching (Mirissa), surfing (Hikkaduwa), seeing sea turtles (Tangalle), diving (Unawatuna/Hikkaduwa), etc. etc. I happened to choose the largest and most developed, but I would easily have taken an extra week or two and lazily made my way through all of them if I'd had the time. Somebody please do this so I can live vicariously through you. Sri Lanka is the land of fruit. Tons and tons of delicious, delicious crazy fruit. I've had a couple orange juices (and made sure they didn't add sweetener) since my first, and they are all crazy sweet and life-changing. Fruit everywhere. In love. I didn't book my hotel until the day of - which also means I didn't look very carefully and use my typical vetting process. 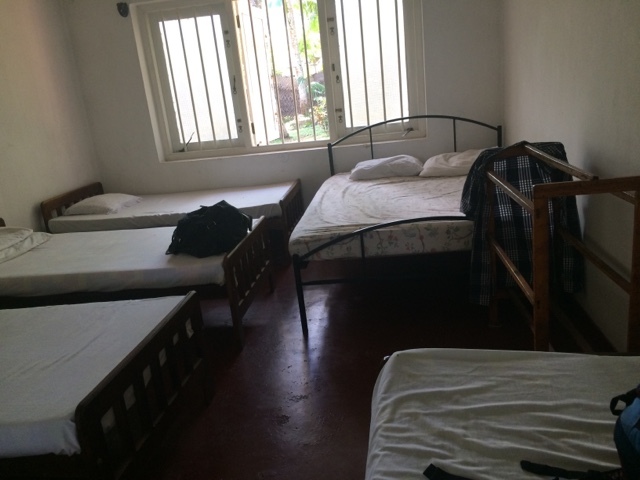 I stayed at the Unawatuna Hostel - which turned out to not be my usual kind of place at all. The owner, Bunchy, was super chill and kind of "meh" about everything - he told us later that the hostel wasn't for profit: he had one day decided he wanted to own a hostel, so he bought a house and turned it into one. It's less of a hostel and more of a landing pad for Bunchy's friends from all over Sri Lanka to come chill - when you walk in, there's always a group of his friends chilling in the family room or around the table. They randomly have parties and backyard BBQ's, and Bunchy goes out of his way to make you feel like part of the fam. He instantly told me to treat his place like home - there are no locks, no lockers (eep! ), the doors are never closed (and they don't need to be given the place is in the middle of nowhere), no rules, no check-in process or anything official - when I first walked in, I was told to put my stuff anywhere and given a plate of food at the table. I didn't even say who I was. To give you a sense of vibe, Bunchy ended his introduction to me with "and if you are here looking to have fun; just ask me and I will take care of it." My room. Well it wasn't my room. I was told I could have any bed in any room I wanted and to just put my stuff down. And I chose this room because no one else was in it, meaning I had the whollle thing to myself. 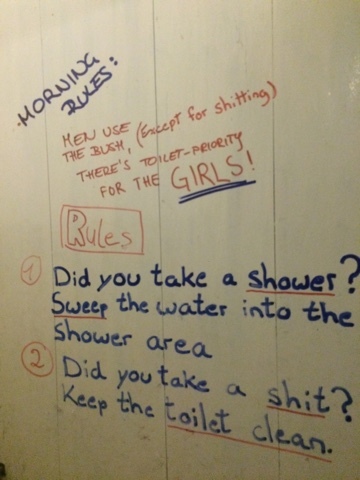 This is written on the bathroom door. This is a great indicator of the place.